Fluid Sound has just wrapped up an exciting project with Barona Casino & Resort in Lakeside, California. Located about 30 miles outside of San Diego, the resort features a 400-room hotel, a luxury spa, restaurants, a golf course, and of course, a gaming casino. 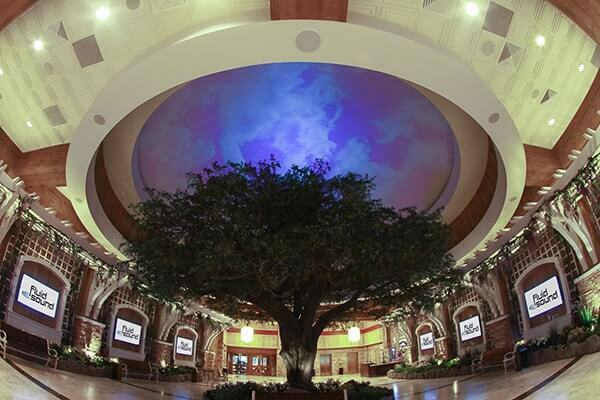 The resort recently expanded its casino floor by 30,000 square feet. 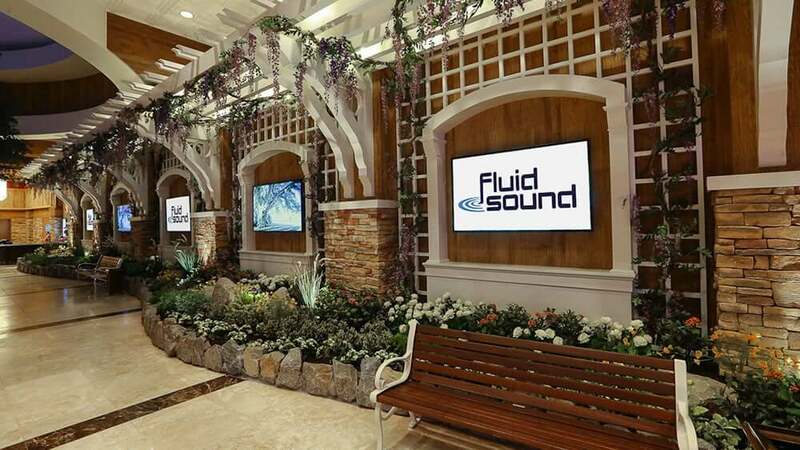 Fluid Sound was brought in as the San Diego audiovisual company to design and install the AV system for the expansion, and also to provide a foundation for the eventual overhaul of the legacy casino systems. When Fluid Sound was first approached by Barona Casino, we were presented with a base bid design that proposed an expansion of the legacy video matrix head end, which had been drawn up by an AV consultant the casino had hired. We offered the casino an alternative design that leveraged HDMI over IP, which would save them more than $250,000 over the consultant’s proposed design. We began work on the casino project in October of last year. We were tasked with the design and integration of the new HDMI over IP 40GB network trunk backbone, and also with installing more than 60 new displays in the expanded area of the casino to be used for both broadcast video and digital signage. Another request we had from the client was for a large dome at the entrance to the new parking garage to be completely covered by video imaging. We were able to give the client the video dome they wanted by stacking two NEC laser projectors with Navitar custom 180-degree fisheye lenses using a 7th Sense video media server for projection mapping and Scalable Display software for projector stacking. In the end, we were able to achieve a 20K lumen image over the entire 40-foot dome surface. This unique feature should have an incredible visual impact and make a lasting impression on casino guests. Throughout the entire design and installation process, we had to keep cohesion in mind. Casinos are all about the cohesiveness of the experience, and Barona Casino is no different. The new audiovisual system had to tie the expansion area to the legacy casino floor in a way that would feel seamless to casino guests. We also wanted to design a system that would give the casino operator the ability to easily create an exciting atmosphere for guests through audio, video, and digital signage. Our system design and implementation will allow them to focus on the creative, rather than the technical, aspects of achieving their desired atmosphere for casino guests through the use of an intuitive and easy-to-operate iPad interface that controls the casino’s entire AV system. If you’re looking for an audiovisual company in San Diego that has experience designing and installing AV systems for companies large and small, we’d love to talk with you. Contact us today to find out more about our capabilities or to get started.